It’s impossible for me to go near a greengrocer shop without coming out with bags of fruit and vegetables. Shoes used to be my weakness, and in fact still are, but to a lesser extent, because nowadays I am obsessed with food and ingredients. A beautiful bottle of truffled oil holds the same allure as the most stunning and sparkly heels. I just can’t help but want them. It’s the same with fruit and vegetables. Last week it was the beautiful and interesting finger limes I spotted at my favourite grocer. I didn’t have a plan for them, I just knew I wanted them and would find a use for them when I got home. And find a use for them I did with the beautiful, and delicious Mojito Cheesecake Parfaits I made last week. Along with bunches of herbs, plump ripe tomatoes, rhubarb was another ingredient I found impossible to walk past. I justified it to myself that my Mum loves rhubarb and I would make a rhubarb cake while she stayed with us last week, which I then promptly forgot about. So I finally made the cake I had originally planned to make while my parents visited – a rhubarb bundt cake. I don’t know what it is about bundt cakes that makes a cake seem that much more special. I’m sure it’s due to the beautiful shape they get from being baked in a bundt pan, which makes them just look so pretty. And it gets even prettier, I think, glazed, with the glaze drizzling down from their peaks. It reminds me of a mountain range capped with snow. I have to admit that the final cake wasn’t quite rhubarby enough for me, so I’ve doubled the rhubarb quantity in the recipe below. Tell me, do you visit a grocer only to come home with bags full of ingredients that weren’t on your list? So I finally made this Rhubarb Bundt Cake with Rhubarb Icing I had originally planned to make while my parents visited . I don’t know what it is about bundt cakes that makes a cake seem that much more special. Preheat the oven to 160 degrees Celsius (320 Fahrenheit) and lightly grease and flour a 24cm bundt tin. Place the sugar and water in a small saucepan over a low heat and stir until the sugar is dissolved. Add the rhubarb and increase the heat to medium and once the mixture comes to a boil reduce the heat to low and simmer for 10 minutes. Set aside to cool slightly and pass the mixture through a fine mesh sieve and reserve the solids for the cake and set aside the syrup for the glaze. Combine the butter, sugar and vanilla extract in the bowl of an electric mixer fitted with a paddle attachment and beat until pale and creamy. Add the eggs to the mixture, one at a time, beating well between each addition. Add the rhubarb and mix until well combined before adding the yoghurt. Finally switch the mixer to it’s lowest speed and add the flour and mix until just combined. Spoon the mixture into the prepared bundt tin and bake for 30 to 35 minutes, or until tested with a skewer. To make the glaze by combine the icing sugar and the rhubarb syrup until you have a slightly runny consistency. Drizzle over the cake. I am an insane food shopper as well, I could spend my entire day at the farmers markets and such 🙂 I have never had rhubarb in a cake before…just beautiful in every way! Love the pink theme going on here — I’ve never tasted rhubarb just yet, but now I can’t wait to! I’ve only made rhubarb in pies, but your rhubarb cake looks so moist and how can anyone resist with photos as gorgeous as these! I always come home with more things than I intended to buy! But rhubarb will always happily be welcome in my groceries – it’s one of my favorite things to bake with! This cake is stunning! I am growing rhubarb! Hopefully I can use it soon. There is no denying how much I love bundt cakes. When I saw this my feed, I almost resisted not to open it because I knew your pictures would be stunning and I would have to bake it. lol. Pinning this, it surely must be baked. I don’t think I’ve had a Rhubarb Cake before ~ but would love to try! Oh my, another rhubarb recipe! And a Bundt! I just adore Bundt’s! A perfect cake for the spring delight of rhubarb, marvelous. I like Bundt cakes. I’ll make these on Friday for my family.Thanks for posting those ingredients and instruction. 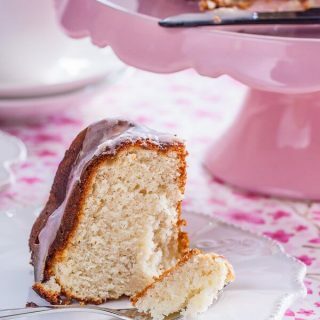 A gorgeous looking bundt cake….rhubarb is such a lovely ingredient and would make this cake taste simply delicious! 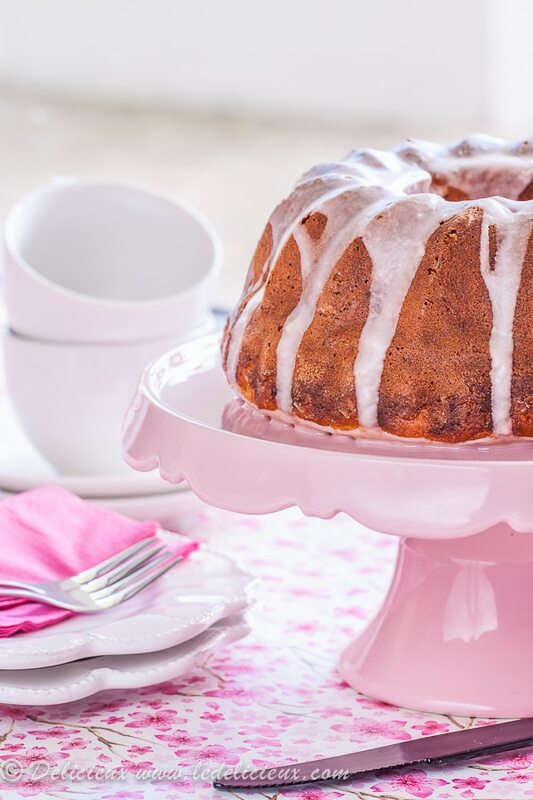 Beautiful rhubarb bundt cake!!! Your photo is gorgeous too. I’m sorry I thought I came to see your post when I saw “rhubarb” but that was previous one. Glad I came here again to double check. I almost miss this gorgeous post! 😉 Pinned! I love bunt cakes. I have the mini bunt tin that I’ve been meaning to use on the Adeline & Lumiere blog but I just haven’t got around to it! It’s coming… promise. A beautiful rhubarb cake, I love it! I have never had rhubarb in a cake before, looks wonderful! I never come home with what was on my list. I always forget something, and add 20 other things! What a lovely cake, and I love the pink cake stand! I am the same way about buying food, I usually come home with something new especially if I go hungry :). I loved your other links to the rhubarb tart and cake both recipes look great. Thanks Suzanne 😀 I love the cake stand too. As soon as I saw it I had to have it. wwoooooooowwww.. i feel that food is for gods. its so perfect and mouth watering..i wanna do that also. Have never heard of rhubarb in cake, but I think I would like it. Rhubarb pie is a favorite of mine. This is really beautiful cake! Your photos making my mouth water!!!! Well done! It’s so hard to resist fruits and vegetables at the farm stand. I happen to have a surplus of produce at the moment and my friends keep bringing me citrus by the bag full. I’m planning to take the entire day today and use it for cooking/baking. I see no other way out of this little situation :). Although looking at all of this girlie pink is making me wish I could find some rhubarb at the farm stand. I think it’s a bit early for us, but I’ve got my radar on nonetheless! The cake looks wonderful. When I was a working girl, I had box upon box of beautiful shoes. But just like you, I’ve shifted some of that purchasing power over to other things 🙂 but there is always room for a new pair of shoes to wear when you’re eating cake, right? What a delicious looking cake! I agree that there is something special about a cake that has been baked in a Bundt tin – they always look so ceremonious. This cake looks really lovely and moist. Thanks for picking that up Thanh 😀 I’ve fixed it now. Oh give me a basket of fresh produce over a pair of high heels any day! LOL. I guarantee I can do more with the produce. I wish I had had better success with growing rhubarb…. I killed each plant with kindness. Our basil has flourished this year though. Jennifer, a lovely post and beautifully captured. Thanks Lizzy 😀 And I’m envious of your basil growing abilities. Mine hasn’t done so well, mainly thanks to the grasshoppers that have taken a liking to it and have been eating all the leaves. Oh I love rhubarb! I was travelling so much I didn’t even realize that it was that time of the year already! I love the cake and I love your photography (as always)! You really take amazing pictures dear! Thank you so much 😀 And the feeling is mutual, I love your photos too. I always get excited when I spot rhubarb at the market, it;s one of my favorite things about spring! 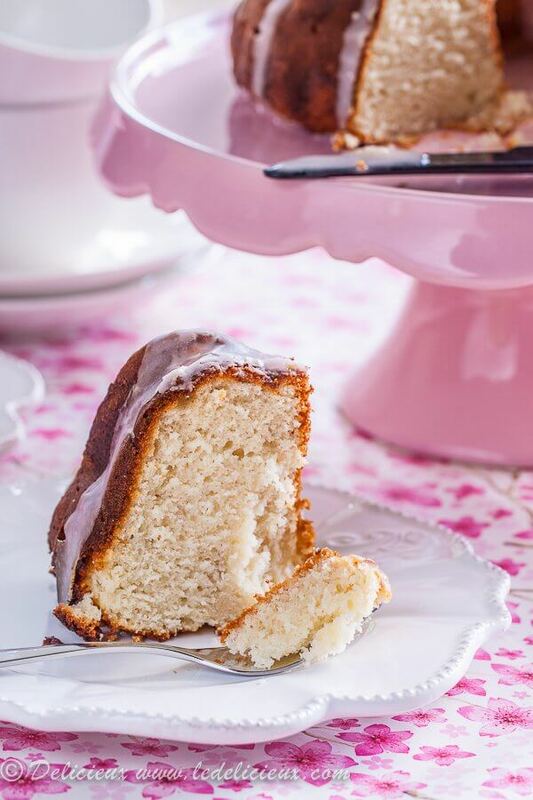 You’re so right – cakes look so pretty in bundt form! Especially love that icing trickling down. Can imagine this would be gorgeous as an afternoon treat, or for dessert with a spoon of rhubarb compote and a dollop of cream. This looks delicious, and your photos are beautiful. Oh, I’d love a slice of that gorgeous cake for breakfast! Lovely texture. delicieux! i’ve never made a cake with rhubarbs yet, but this could be the ONE! I wonder how it tastes? I’m sure it’s dee-lightful! 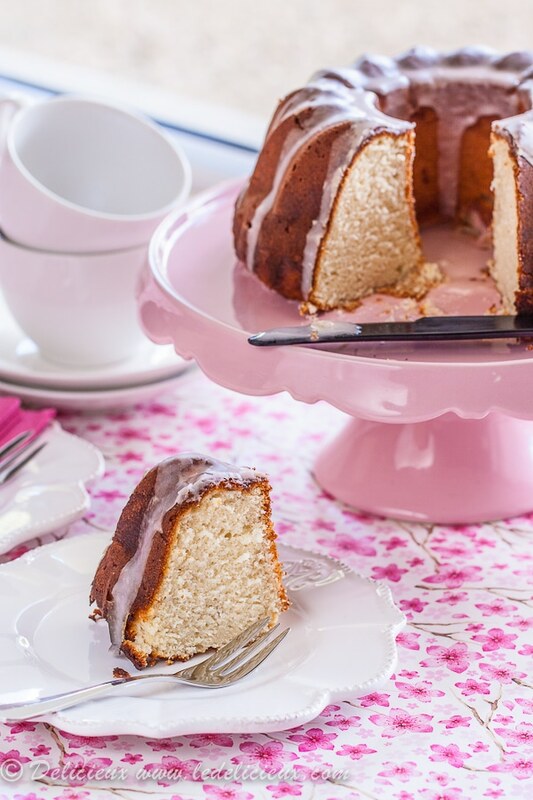 For some reason bundt cake always makes me thing of cute little afternoon teas with dainty tea cups and lots of pink. No idea why though but I know what you mean about it sounding special. I’m terrible at that! On Sundays I now only take a certain amount of cash to the markets or I’ll come home with my grandma trolley full to the brim. I’ve been in the mood for making a bundt for work this week! Also, I’ve moved from shoes to food as well. Plus, a wedge of organic goat cheese is so much less expensive than a new pair of shoes….and I do have to eat…. I love bundt cakes and yours is so pretty! I’ve found a lovely grocer at Stafford city too, which have wonderfully huge bunches of basil that I buy and make mounds of pesto from. I also love the grocer at Chermside, the one near Coles, which is where I found the finger limes. Ashgrove have some of my favourite grocers too, but I don’t often get to that side of town now. Love the pink in these pictures! And such a wonderful cake!! The rhubarb glaze is fantastic!! !